One of the core principles in biodynamic agriculture is the sacred connection between the Cosmos and Earth. Rudolf Steiner firmly believed that working with the land depended upon working in harmony with the rhythms and patterns of the star systems and the planets. There is a “right time” to plant, to hoe and to reap such that this timing ensures better quality and quantity of produce. Accordingly, the farmer/gardener must be in tune with these natural rhythms and patterns. The focus of this article is to explore the rhythmic patterns and timings of the planet Venus and their implications on agriculture. 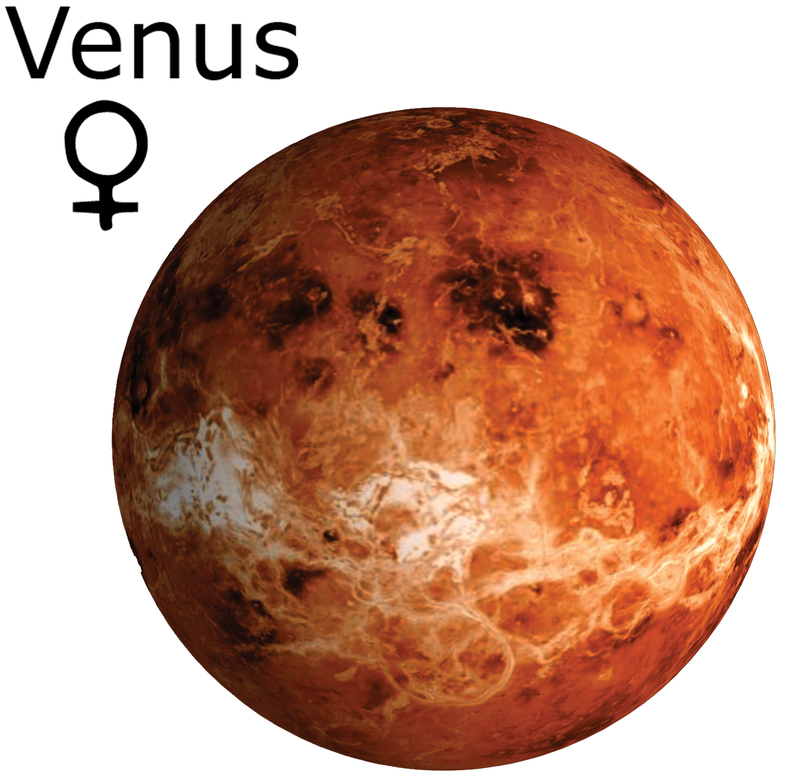 The symbol for the planet Venus is the same glyph used in biology and medicine to represent the female: a circle resting on a cross. The circle is infinite, no beginning, no end; it represents eternity, perfection and wholeness. This same circle with a dot in the middle is used to represent the Sun A. The angles of the cross correspond to the four directions of the compass (north, east, south and west) and to the four elements (earth, water, air and fire). The point where the horizontal line meets the vertical line represents the intersection between Cosmos and Earth. In summary, the symbol for Venus D-- represents the bringing of spirit into matter. Being closer to the Sun than Earth, Venus takes some 224.695 Earth days to complete a full orbit. Sidera is Latin for star. Thus, the sidereal cycle, that is the time taken for Venus to complete a full cycle around the Sun and return to the same spot, is 224.695 Earth days or one Venus year. Earth orbits the Sun in 365.242 days, implying that for every eight orbits of the Earth around the Sun, there are thirteen orbits of Venus. Venus is one of the brightest stars in the night sky. Only the Sun and Moon are brighter. Like the Moon, we see the Sun’s light increase and decrease as it reflects off Venus along her path around the Sun. From our Earth-based perspective, Venus takes approximately 584 days to travel back to the same spot in the sky (synodic cycle). There is some variation in this cycle; it ranges between 580 to 588 days. During half of this time, approximately 292 days, her light increases (waxing) and during the other half, her light decreases (waning). Once every 584 days (about 18 months), the Sun comes between Earth and Venus. This exact intersection is called the Full Venus [point G] or the superior conjunction of Venus. Venus is behind the Sun and she is invisible from Earth. Approximately 292 days (about nine months) later, Venus appears in front of the Sun as seen from Earth. This configuration is called the New Venus [point A] or the inferior conjunction of Venus. Ancient Meso-American astronomers tracked the path of Venus and recorded seeing her as a small dark speck when she was directly in front of the Sun. This Sun/Venus eclipse is also refered to as Venus transiting the Sun. In summary, there are approximately 584 days between two inferior conjunctions or one Full Venus cycle. This New Venus to New Venus synodic cycle from our Earth-centred vantage point is similar to the cycle between one New Moon and the next New Moon. The superior conjunction of Venus is similar to a Full Moon event. When Venus is travelling out from behind the Sun and her superior conjunction [point G], towards her inferior conjunction [point A] in front of the Sun, she is visible from Earth for several months around sunset. In this waning phase, Venus is called the Evening Star. 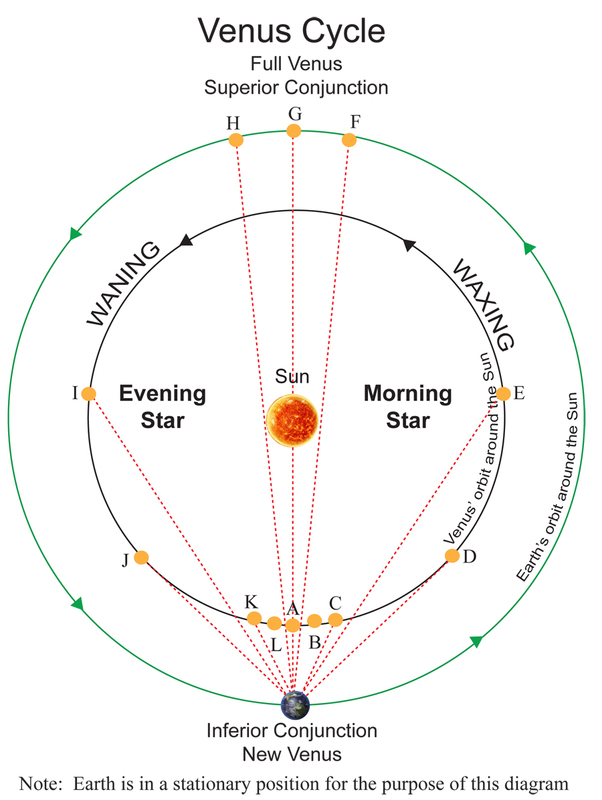 After the inferior conjunction [point A] in front of the Sun, she becomes visible before sunrise as the Morning Star and begins her waxing phase. From our vantage point, when Earth is moving faster in its orbit compared to the speed of Venus in her orbit, it appears to us that Venus is moving backward, or retrograde. This is much like travelling on a faster moving train that passes a slower moving train going in the same direction. The slower moving train appears to be travelling backward. From our vantage point, when Earth appears to be moving at the same speed as Venus, we perceive Venus to be stationary. Thus before going retrograde there is a stationary period. Stationary retrograde is the point where Venus moves from direct to retrograde [point K], and stationary direct is the point where Venus moves from apparent retrograde motion to direct or forward motion [point C]. Venus spends approximately 40 days and nights moving in this apparent backward direction, that is retrograde. In eight Earth years, Venus appears to move backwards five times. Many ancient astronomers including Johannes Kepler and Sir Issac Newton understood this forwards and backwards dance by Venus. They charted the course of Venus over time and plotted the famous five-petaled rose pattern of the Venus cycle. A most unique quality about Venus’s orbit is that it is the most circular of all the planets in our solar system. It is this consistency that generates her beautiful repeating patterns. The cosmic dance between the Venus and Earth rhythms is so harmonic that this 5-to-8 ratio has been applied to buildings of a spiritual nature throughout the ages, by many cultures and places around the world, including the great pyramids of Egypt, the Mayan pyramids as well as cathedrals throughout Europe. While Native American stargazers paid close attention to the New Venus to New Venus cycle, they also made careful observations of this planet’s greatest eastern [point I] and western elongation [point E]. In theory, the greatest eastern elongtion is equivalent to the last quarter and the greatest western elongation is equivalent to the first quarter (similar to our lunar phases). The Meso-American astronomers constructed observatories and temples with specially-placed windows from which they observed these eastern and western elongations. The timing of these elongation moments was carefully recorded for thousands of years. El Carocol—This is one of several sacred places where the Mayans built observatories aligned with Venus’s position in the sky. 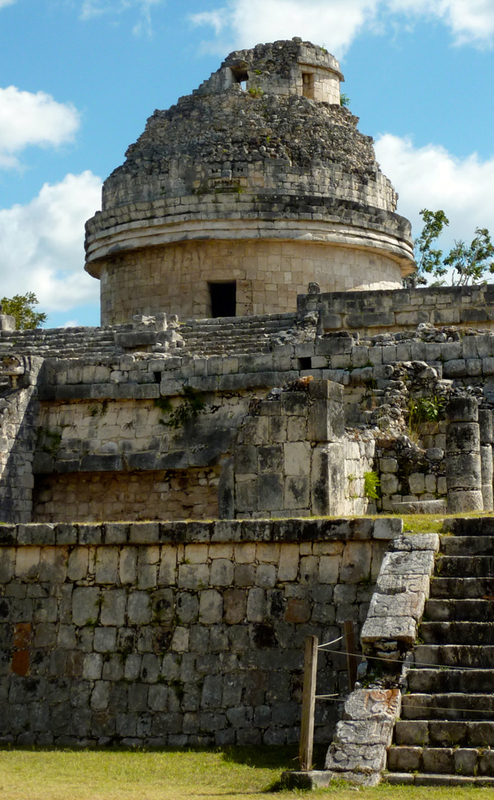 This particular observatory near Chichen Itza is also aligned with the summer solstice sunrise and winter solstice sunset. These ancient stargazers also noted the relationship between maximum elongation and brightness of this planet. A little over a month (37 days) before and after Venus reaches her inferior conjucntion [point A], she reaches maximum brightness as the Evening Star in her waning phase [point J] and as the Morning Star in her waxing phase [point D]. While it is generally understood that Venus is the brightest star in the sky next to the Sun and the Moon, we now understand that this luminosity varies slightly with its position with reference to the Sun and Earth. Her maximum brilliance occurs twice during one Venus cycle, that is, ten times in every five Venus cycles. 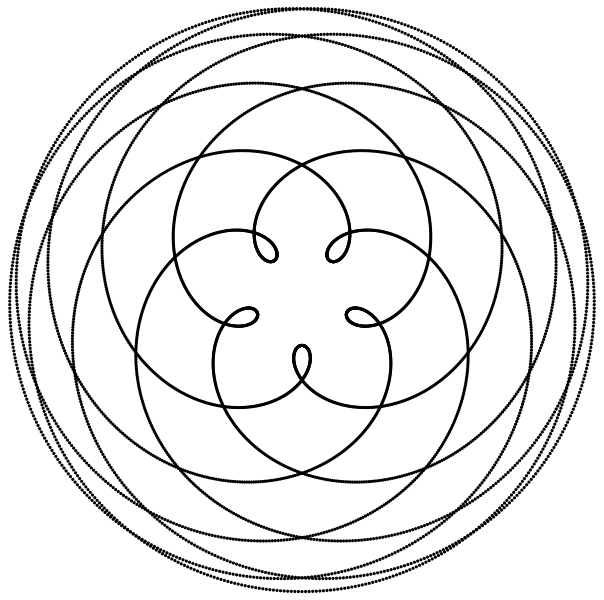 This tenfold pattern blends harmoniously with the fivefold image Venus portrays in her five-petalled rose pattern. Based on ancient mythologies, Venus represents the feminine and fertility. Speaking of fertility, our planet is currently at a turning point with respect to health and well-being of the myriad of pollinators, including the honey bees. With the extensive use of pesticides and herbicides throughout the world, there is a direct correlation to a depletion of these pollinators that is closely approaching a critical point. Acknowledging their vital role to transform flowers and stamen into fruit and seed and protecting these pollinators is a clear and undeniable message Venus brings to us today. Two additional teachings Venus offers are the supreme gifts of beauty and consistency. Her rose-pattern cycle is uncannily identical to the five-petaled flowers of the dicotyledons (flowering plants whose seed have two embryonic leaves or cotyledons). During a period of eight years, five synodical Venus/Earth rotations complete one full cycle. After this eight-year period, the sixth rotation of Venus begins approximately at the same place that the first period started. Consistency and beauty create a sense of harmony that goes beyond words. The beauty of these flowers with five sepals and five petals are a reminder of this spirit/matter connection that Venus reflects. The properties of the Golden Mean reflect the Venus/Earth cycle of eight Earth years compared to five Venus years. This ratio has not only an aesthetic appeal but also a practical application. When building a barn, house or shed, this golden ratio of five to eight can be incorporated into its dimensions. It is also worthwhile to observe what goes on during the retrograde periods of Venus. It may be time to inwardly reflect on one’s values, one’s goals, one’s sense of self-worth, at a personal level, a farm level and at a community level. How can we enhance fertility? How can we honour our feminine powers? Given that Venus takes care of blossoming and how flowers grow, how can we consciously connect with this energetic impulse from the Cosmos? How is Venus speaking to you? What is she guiding you to perceive? Appreciate? Enjoy? Reflect? Value? What sort of harmonic rhythm can we introduce into our lifestyles to honour this cosmic connection? How has our relationship with nature shifted as we observe and experience each Venus cycle? Steiner teaches that the most powerful astronomical times occur when Venus is directly behind the Sun, that is, in a superior conjunction and at the same time in the constellation of Scorpio. The following chart outlines one eight-year Venus cycle and identifies when Venus is in Scorpio. Steiner taught that pest control using an ash preparation was best applied when Venus is in Scorpio and behind the Sun.